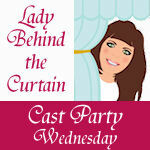 I first did this tutorial as a guest post on Ready, Set Craft! this summer. 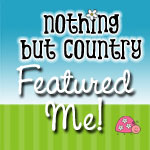 But thought it would be a great indoor craft project for all these snowy winter days most of us are having. 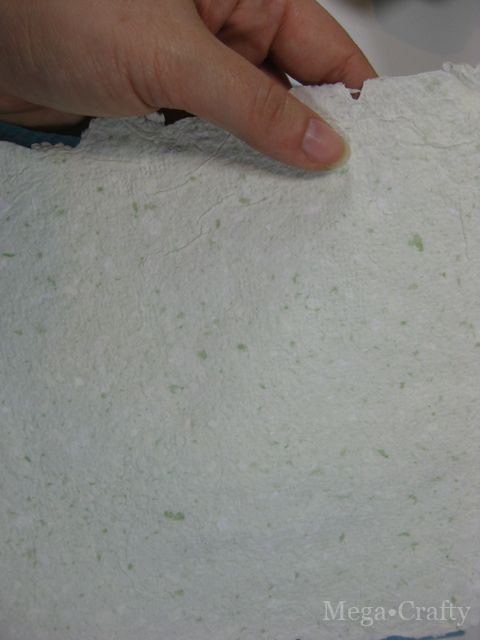 Making your own paper using recycled paper is fun and easier than you might think! I first made paper back when I taught museum programs for kids. But it’s not just a great project for kids. 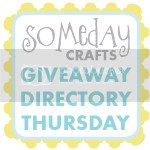 I’ve enjoyed making paper for my own cards and crafts over the years. 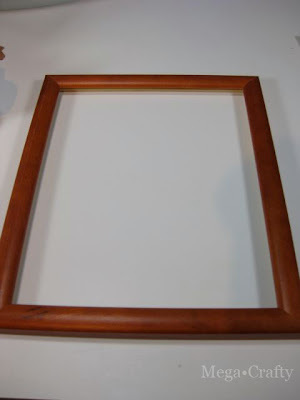 A cheap wooden picture frame (You can find frames at almost any dollar store or discount chain, I think I paid a dollar each for mine). 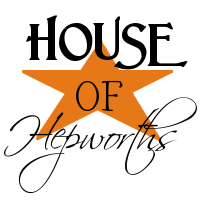 Any size you like is suitable but 8x10 or 11x14 are the easiest work with. 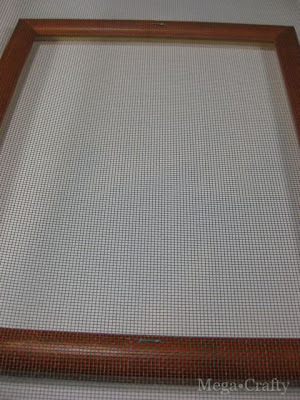 Roll of fiberglasss window screen. You don’t need anything fancy. Mine was inexpensive (6 dollars at a home improvement store) and there is enough to make more paper frames than I’ll ever need. 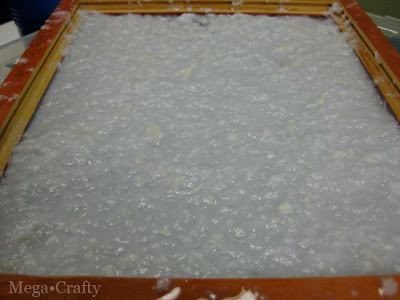 First, in order to make paper you’ll have to make a paper frame. 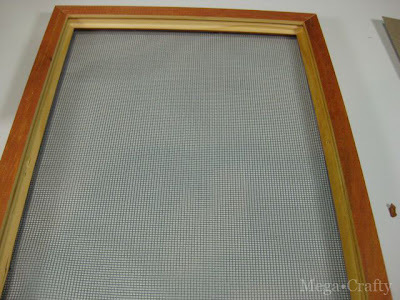 Remove the glass and cardboard backing form your frame- you’ll only need the wooden part. 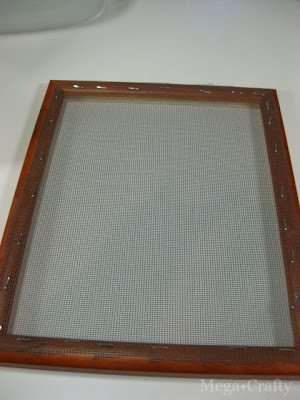 Cut a square of screen that fits over your frame. 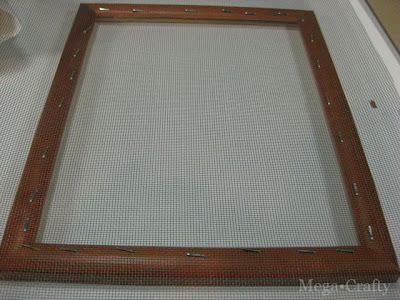 Lay the screen over the front side of the frame and staple once to hold it in place. 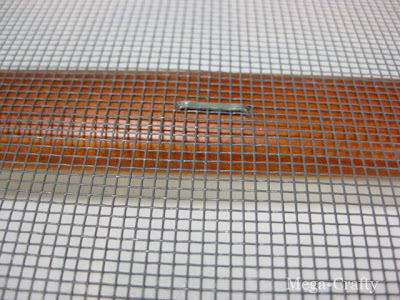 Pull the screen on the opposite end of the frame so it’s tight and staple in place. Work you way around the screen, pulling the screen tight over the frame and stapling it into place. Cut the excess edges of the screen off. If you want you can use duct tape to cover the staples and ragged edges of the screen. 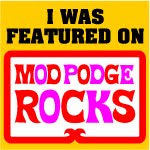 (I didn’t but it’s probably a good idea if you are going to do this project with kids). Once you have the paper frame made you’re ready to get going. 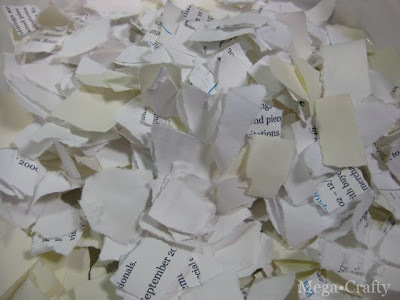 Start by ripping paper into small pieces. I like to rip paper in big bunches at a time so I wind up with a container full of paper bits that I can grab anytime I need to make more paper pulp. Mostly I’ve used white and cream colored printer and notebook paper that results a white/off white pulp that can be left as is or colored if I want (by adding bits of colored tissue paper into the blender with the white paper). 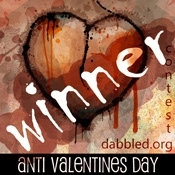 You could also use torn up colored paper if you like. 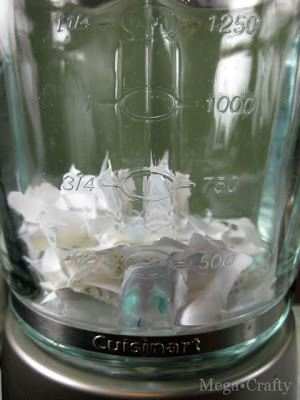 Note: You can also use paper from your shredder but you’ll end up with a confetti textured paper. The blender doesn’t chop of those small shreds very well. 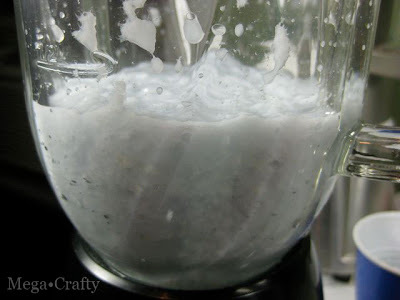 Place a few handfuls paper into the blender. 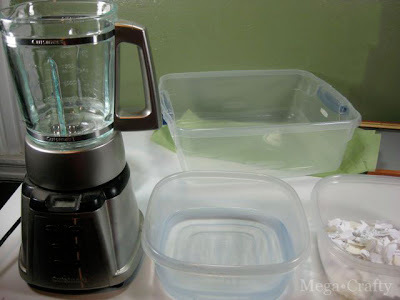 Make sure to use an old blender, one that won’t have any food prepared in it anymore. Once you’ve blended the paper you’ll want this to be a “craft blender” form now on. I don’t fill the entire pitcher- this is just asking to burnout the blender! Add about twice as much water than you’ve got paper and blend on high about 15 seconds until you get a fairly smooth looking pulp. (the occasional pulse also helps to break up any large clumps). Pour the pulp into your large container. 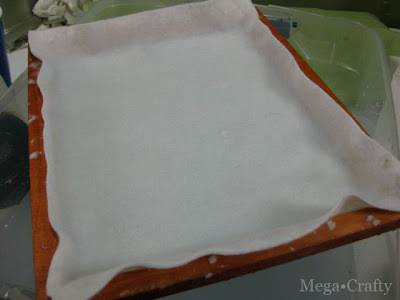 Now add enough water so you are able to dip the screen into the paper slurry. And it’s time to dip the screen, it should go in staple side down. Dip your frame in like your digging or shoveling (tilting front end in first followed by the back) so that you get a slight scooping action. If you’re doing this project with kids- younger ones usually need help dipping to avoid the screen plopping in straight down. The key here is to get the water to sort of flow over your screen evenly. 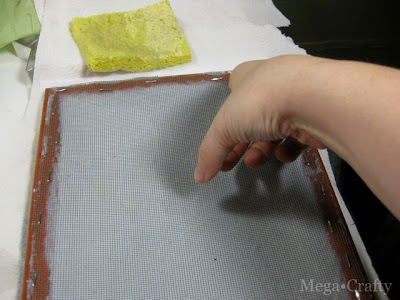 The water will go through the holes in the screen but the little bits of paper suspended in it will get stuck.You’ll get this nice pretty screen of sopping wet paper pulp. 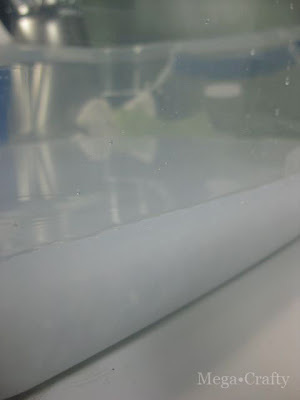 Let the screen drain over the container for a minute. 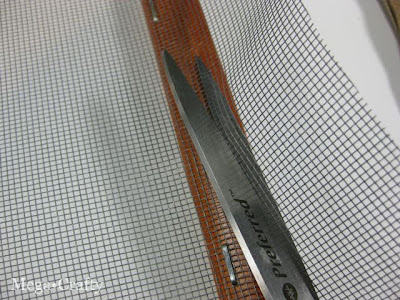 While it’s draining now is a good time to remove excess clumps from the edges of the screen and frame. Remove that sheet and place another over the frame. 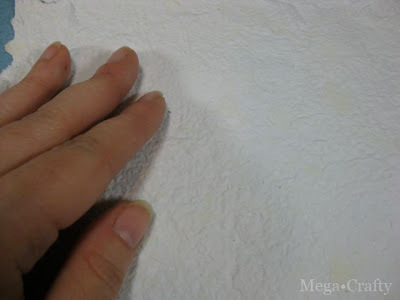 Flip the frame over onto a stack of newspaper and paper towels or a tea towel. 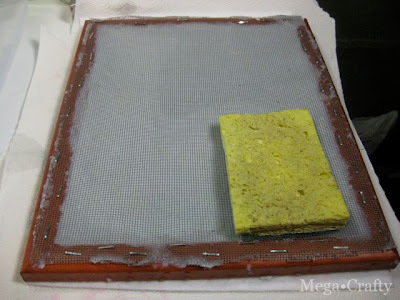 Use a sponge to press out more of the water from the screen side. 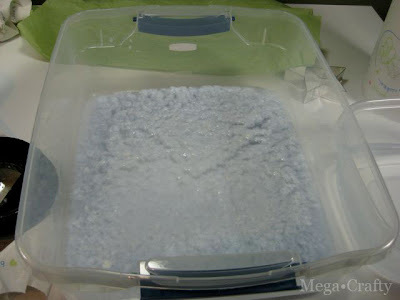 You can squeeze the sponge out in the container of paper slurry. Now flick the screen with your finger to help the paper release (this is most little kids favorite part). Once you remove the frame you can let your paper dry overnight on the felt.You’ll end up with a lovely handmade sheet of paper! 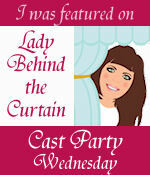 Want to know more about making paper- check this post out too. I love this. The last time my son made paper he broke my blender. I never use a blender anyway..